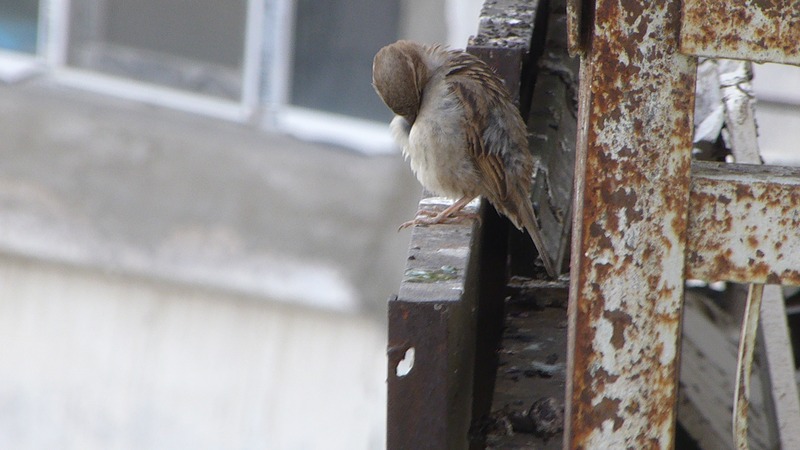 On the fifth floor, we see a lot of birds passing, here are a couple of photos of our avian visitors close up. 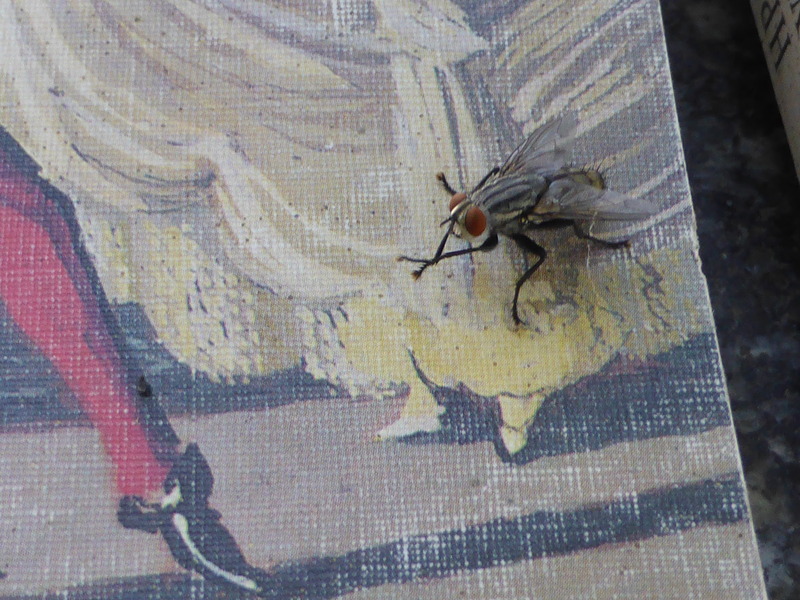 This week’s challenge is entitled “Close Up” (click on the link to see other interpretations). 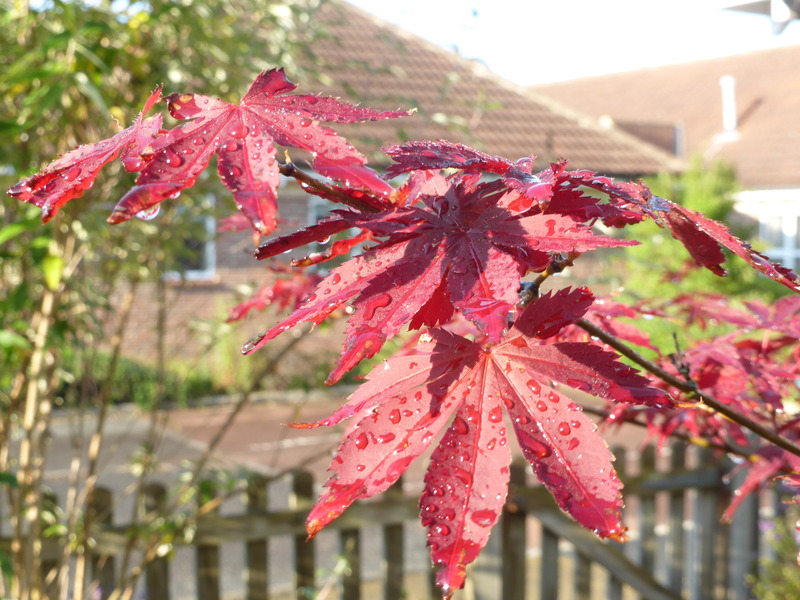 I notice many other bloggers have submitted stunning photos of bees, flowers, butterflies and dewdrops. I like to be different. 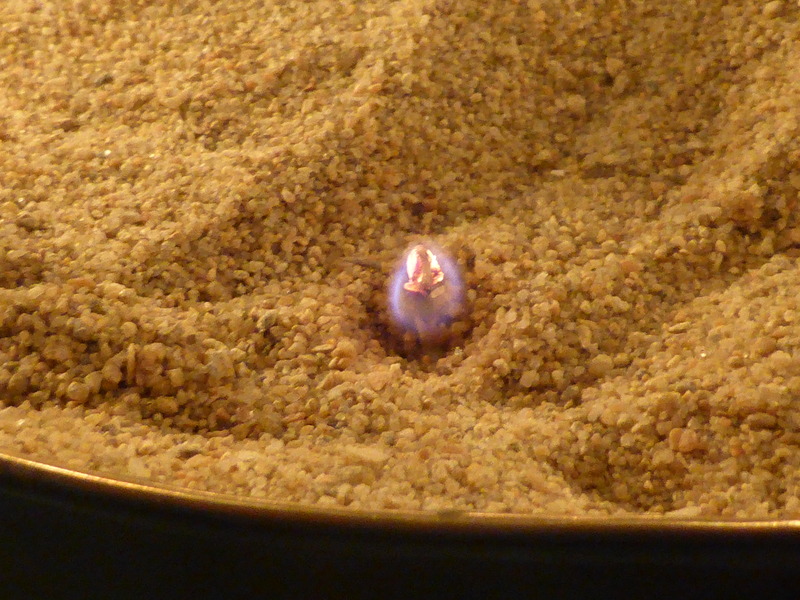 My image is a close up of a candle on the verge of dying. 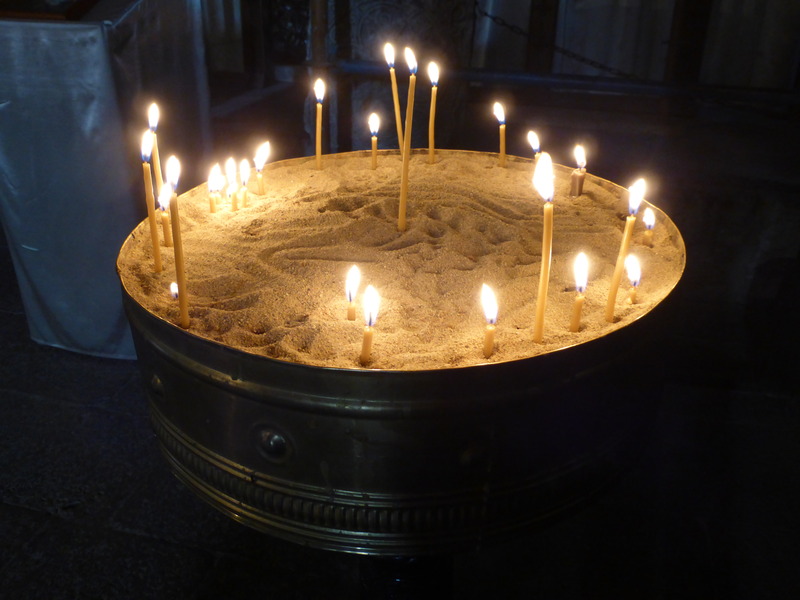 This was taken in an Orthodox Church, where candles are bought and lit and put in sand receptacles as prayers are said. The second image is to give some context to the first. 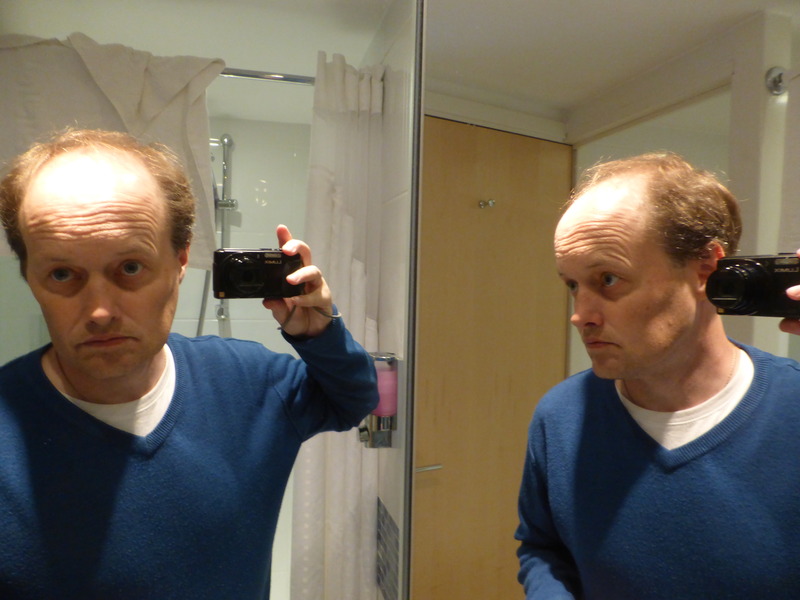 A strange theme this week, here I am playing around with two mirrors and my camera in a hotel room….where did all those wrinkles, come from? It wasn’t with a minibus full of my wife’s colleagues. It wasn’t reached by minibus, but by train. It wasn’t in Georgia but in England. We were in England for a week to visit my ageing mother in York. 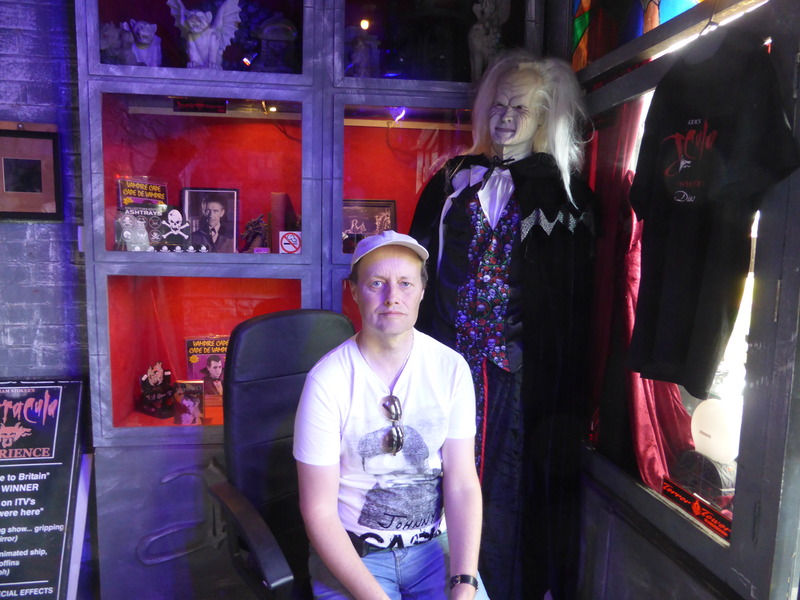 I decided it would be interesting to make a day trip on one of those days and I chose Whitby for our destination, having recently read Dracula. 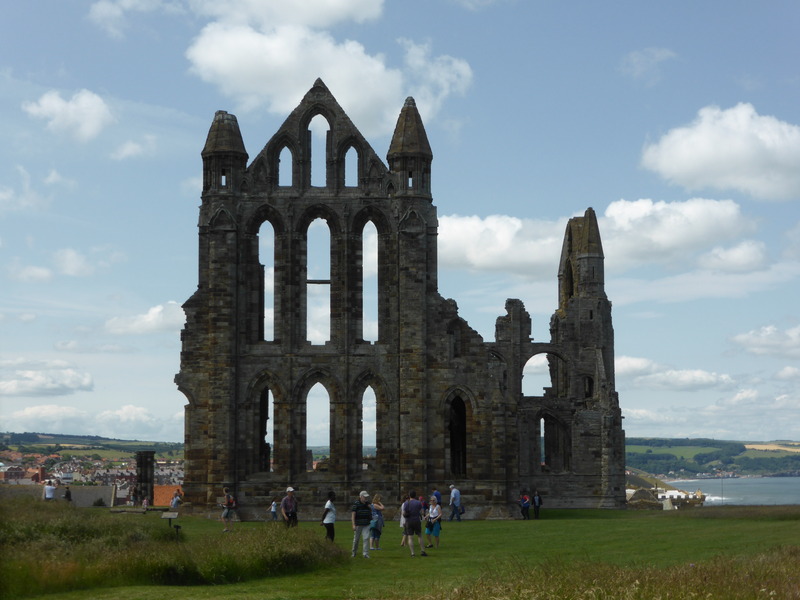 The famous Count chose to land in England, at Whitby on his voyage from the Black Sea. 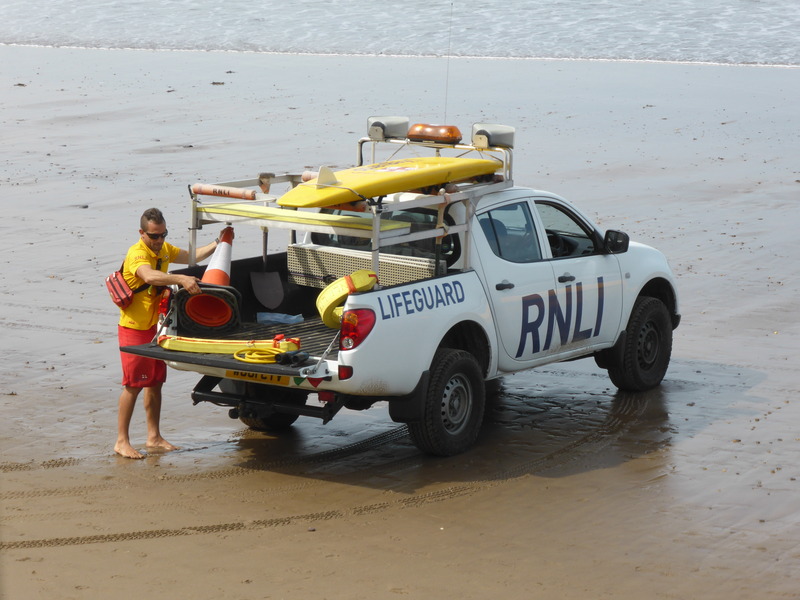 It would have been a much shorter trip to go to Scarborough, which has direct trains from York, but Whitby with a change in Middlesbrough has more to see. When we arrived after a journey taking around 3 hours (Scarborough could have been reached in little over one hour), we headed first up the 199 steps to the ruined gothic Abbey on top of the hill. We didn’t go in the Abbey Grounds (£7.50 each seemed a little steep, when did England become so expensive? ), but we did admire the view over Whitby and stumbled upon a wonderful pirate festival. Click on the pirate photos to see the gallery. As well as pirates there was a festival of street-choirs and lots of tourists. 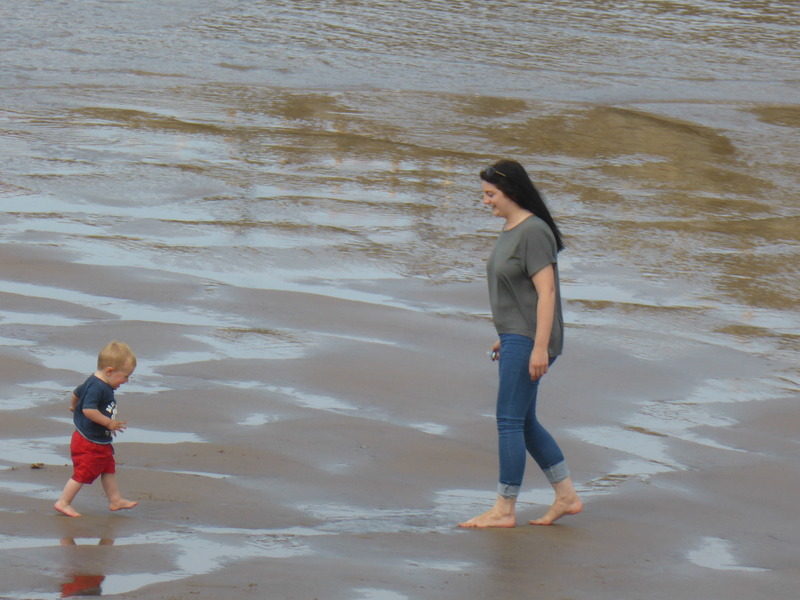 Whitby is steeped in history as a fishing port and where Captain James Cook was taken on as a Merchant Navy apprentice. 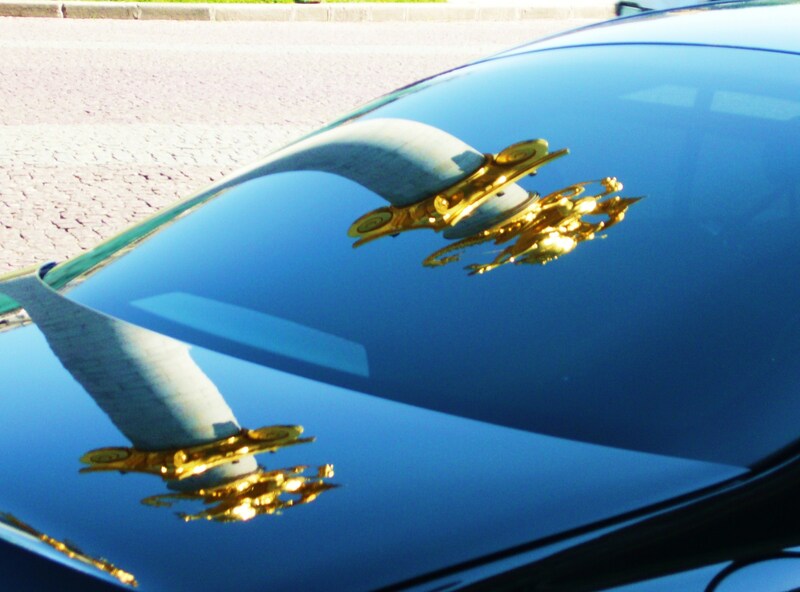 The Gothic abbey and the Dracula connection make the town a mecca for goths, who can pick up jet jewellery and various gothic trinkets to add to their collections. 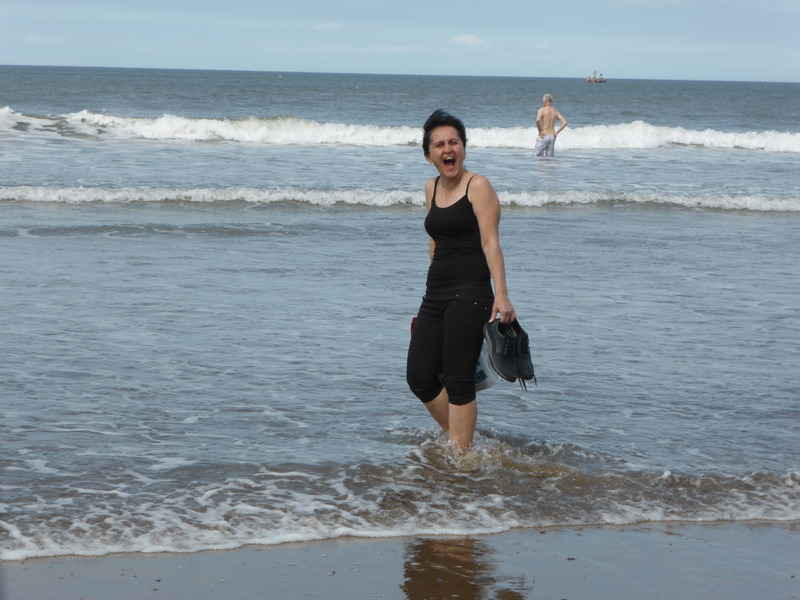 As with many seaside destinations there are also the usual attractions of the British seaside: rock, sandcastles, the sand between your toes and the icy waters of the North sea for those brave enough to venture into the waters. 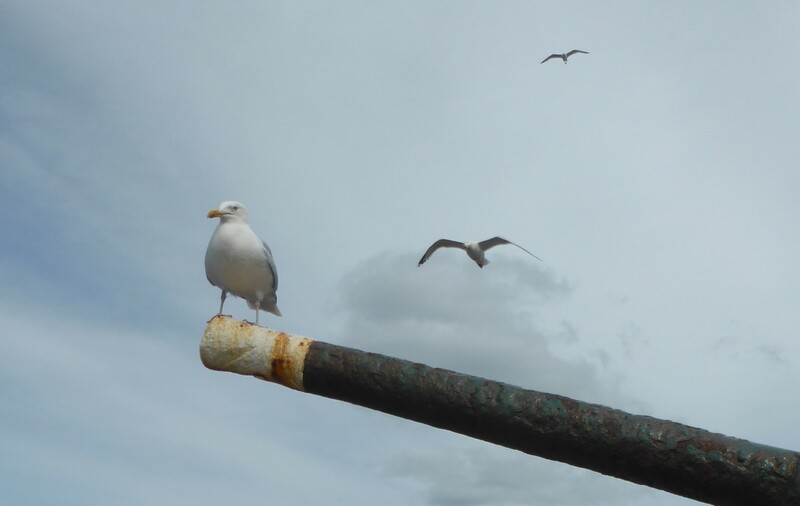 Another visitor to Whitby is the seagull. 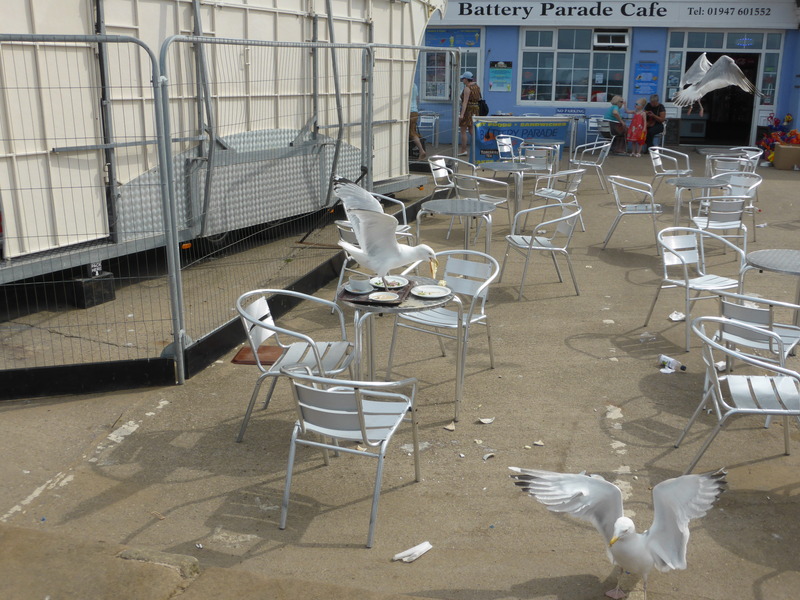 Unlike most birds the seagulls don’t fly away as you approach. 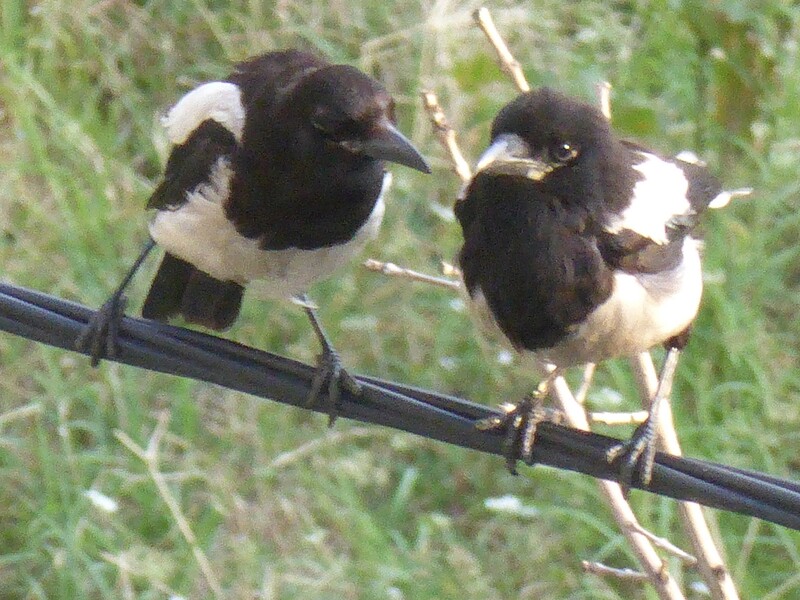 They are on the lookout for choice titbits left by tourists and will happily dive onto an unguarded plate. 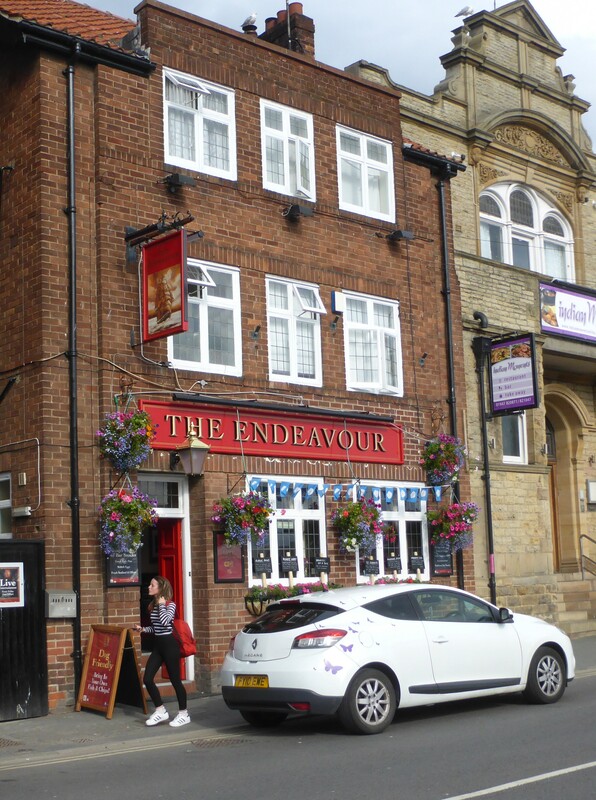 At the end of our trip we relaxed in a pub named “The Endeavour” after Captain Cook’s ship and Khato tried some English beer, to slake her well earned thirst. 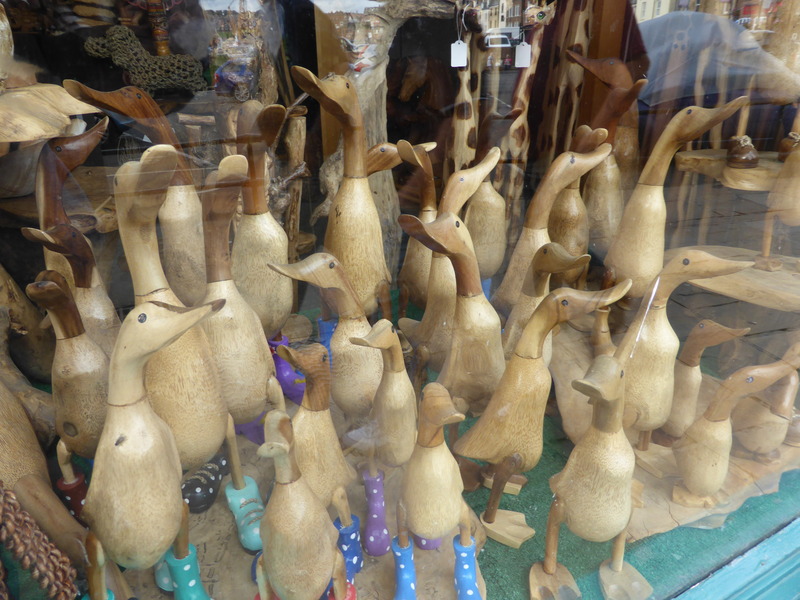 Are these the lucky Whitby Ducks, Hugh? Saint George links my past in England with my present in Georgia. 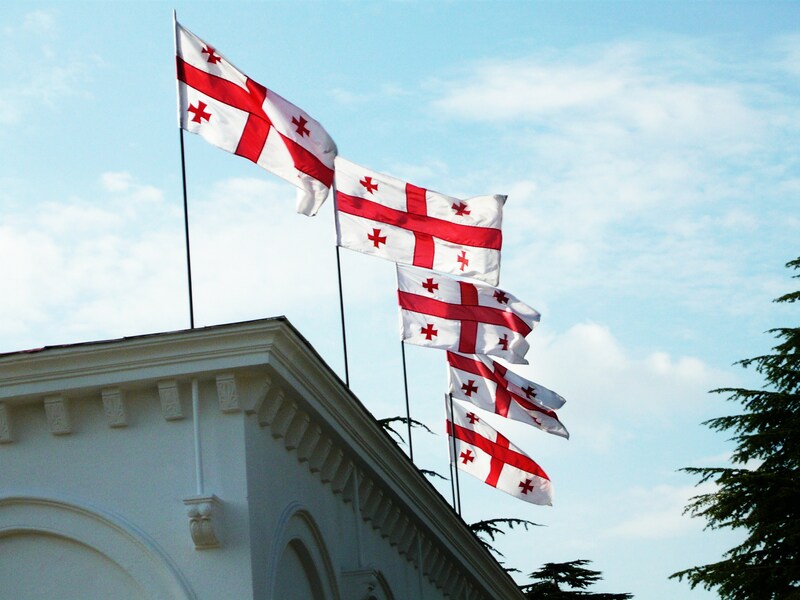 The flag of England has one cross of St George, the flag of Georgia has five. 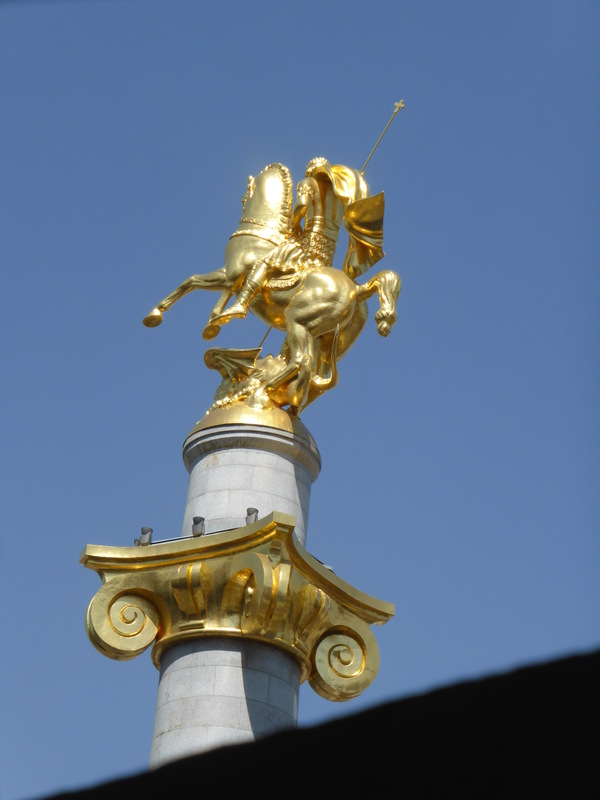 St George is patron saint of both countries. The “real” George may have been born in Palestine in about 270 AD, to a Roman father and a mother from Cappadocia, in what is now eastern Turkey. He served the army of the pagan Emperor Diocletian until the order came to persecute fellow Christians. George would not deny his faith, so he was tortured, buried in the sand and finally beheaded, in the town of Lydda on 23 April 303. Historians disagree about many of the facts. George is a man with a complex heritage, born as cultures and empires were colliding. George is a foreigner to both England and Georgia, although he lived considerably nearer to Georgia and his mother came from Cappadocia like the other major Georgian Saint: Nino, who is said to have brought Christianity to Georgia. Saint George is somewhat of an exception among saints and legends, in that he is known and respected by Muslims as well as by Christians, his stature in the Middle East derives from the fact that his figure has become somewhat of a composite character mixing elements from Biblical, Quranic and folkloric sources, at times being partially identified with Al-Khidr, a righteous servant of Allah, who possessed great wisdom or mystic knowledge. He is said to have killed a dragon near the sea in Beirut and at the beginning of the 20th century, Muslim women used to visit his shrine in the area to pray for him. 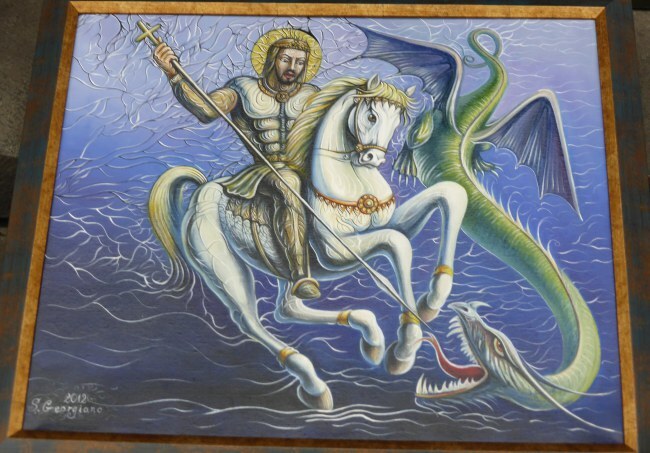 Image of St George fighting the dragon. 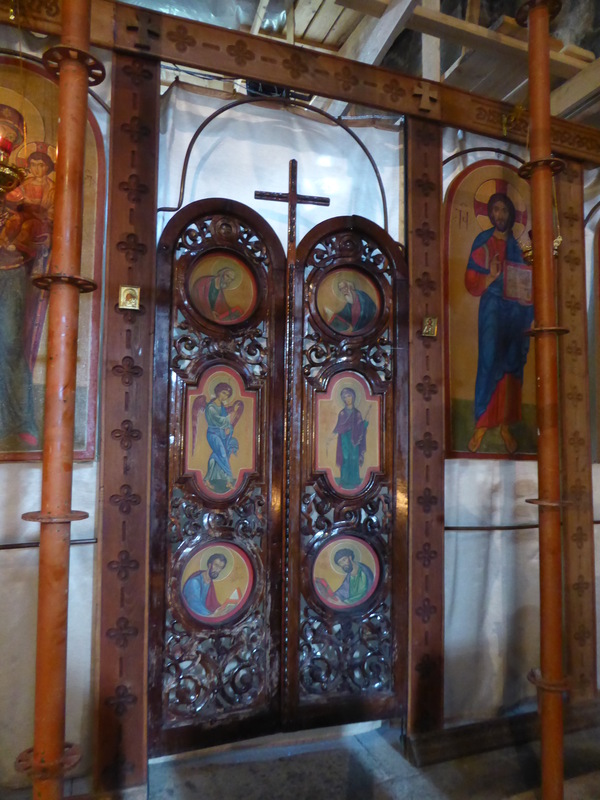 This is the angel door at Atenis Sioni 7th century church, separating the nave and the sanctuary. 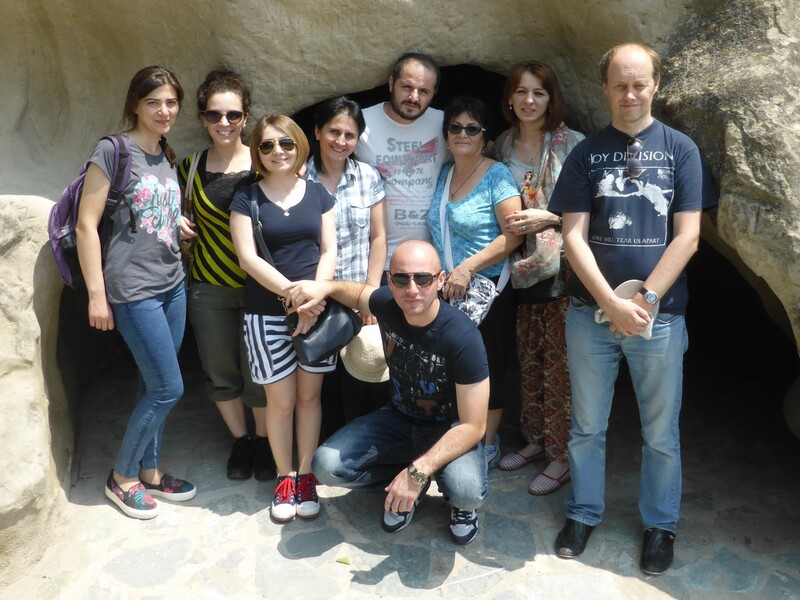 Uplistsikhe is a cave city complex like Vardzia, the destination of my first trip with this group of Khato’s colleagues. 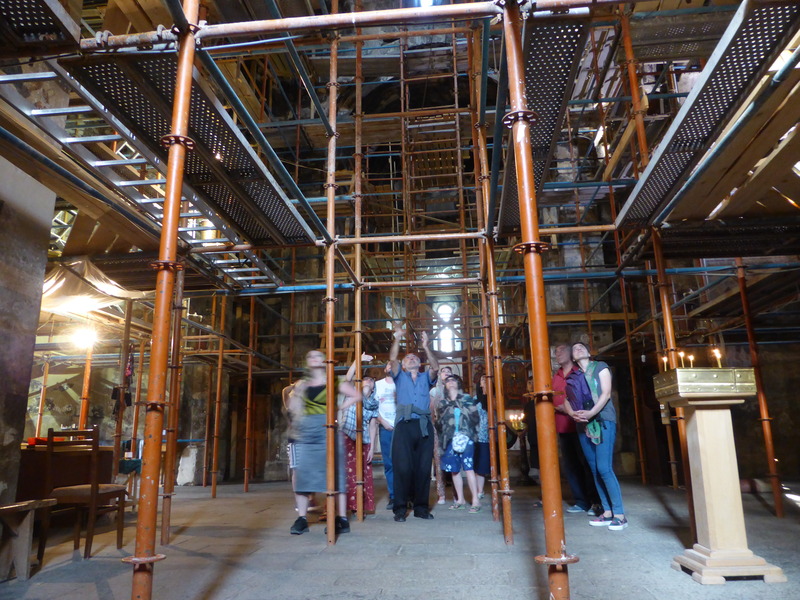 As is usual with these trips, we got up early, we had been told to meet the minibus at 8.30am at Didube in Tbilisi. With true Georgian timing the minibus didn’t actually leave until 9.15am, when the last of the stragglers arrived. 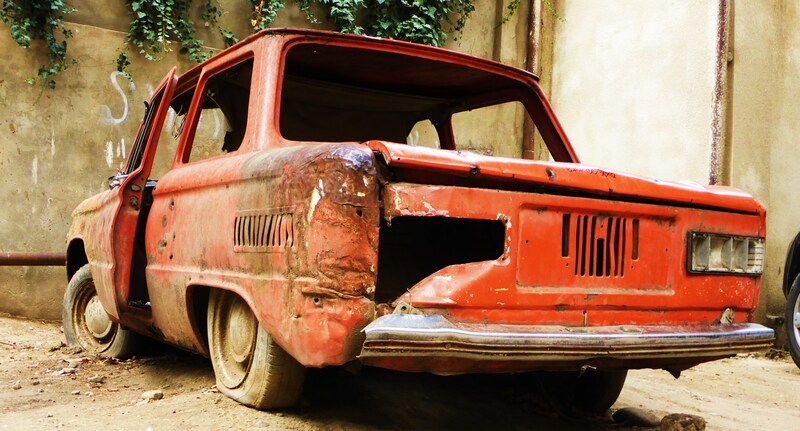 Our first stop was Gori, a town famed as the birthplace of Joseph Stalin, Georgia’s most famous son. Our stop was not for sightseeing but to pick up some fruit for our supra (Georgian Feast) later. There used to be a statue of Stalin in the main square but it was taken down in 2010. Here is a statue of a different “hero”. 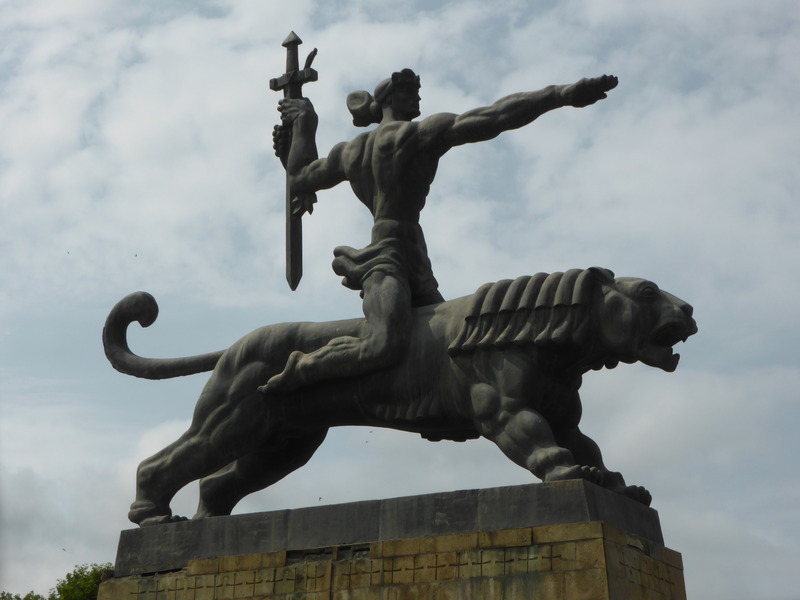 “Lomkatsa” or ” lionman”, a fictional Georgian adonis, sculpted by Elguja Amashukeli in 1986 . 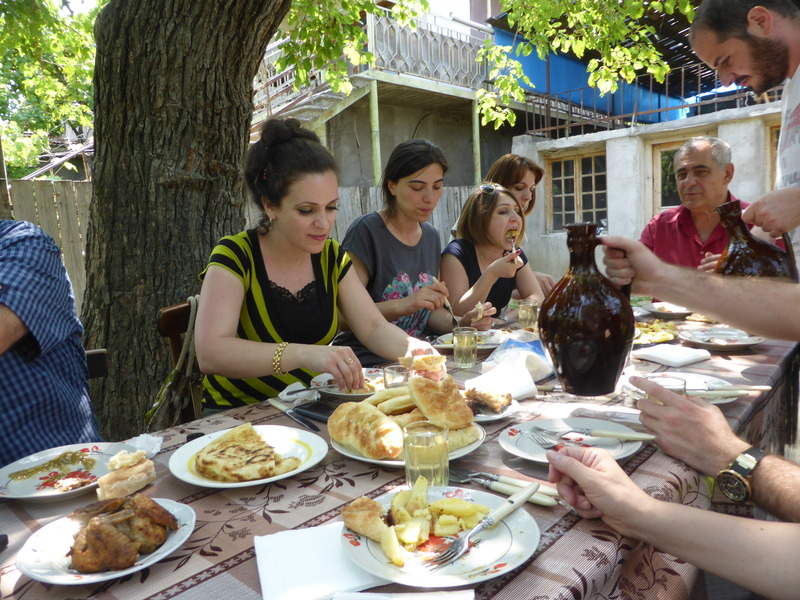 Uplistsikhe is 10 km from Gori, and sits scenically on the banks of the Mtkvari. It has been a settlement since the early Iron Age and is possibly the oldest urban settlement in Georgia, the main development was from 6th Century BC to 1st Century AD. 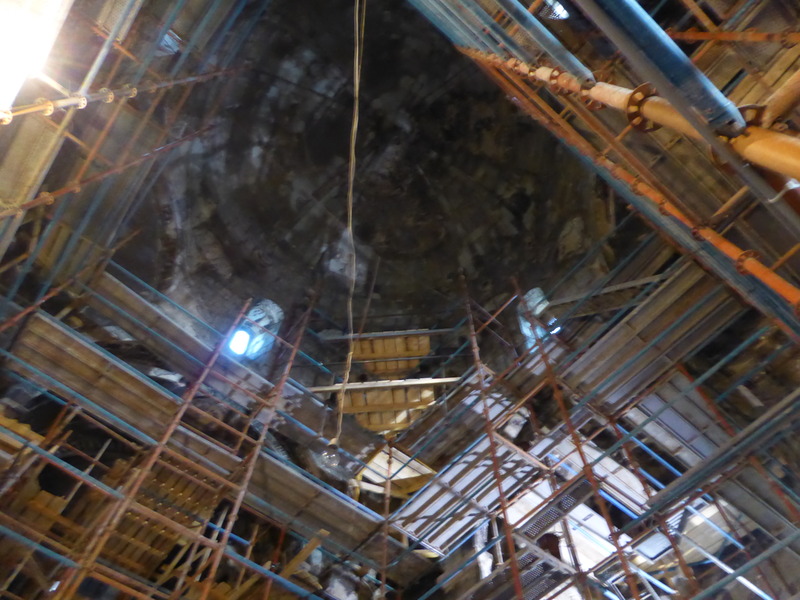 It has a strategic position on the Silk Road, linking east with west, archaeological digs in the area have revealed artefacts from east and west. The city was an important religious centre in pagan, pre Christian Georgia and magic ceremonies were still practised here until the 18th century. Archaeological studies show that from 4th Century AD to 6th Century AD there was a struggle between the Christians and Pagans. 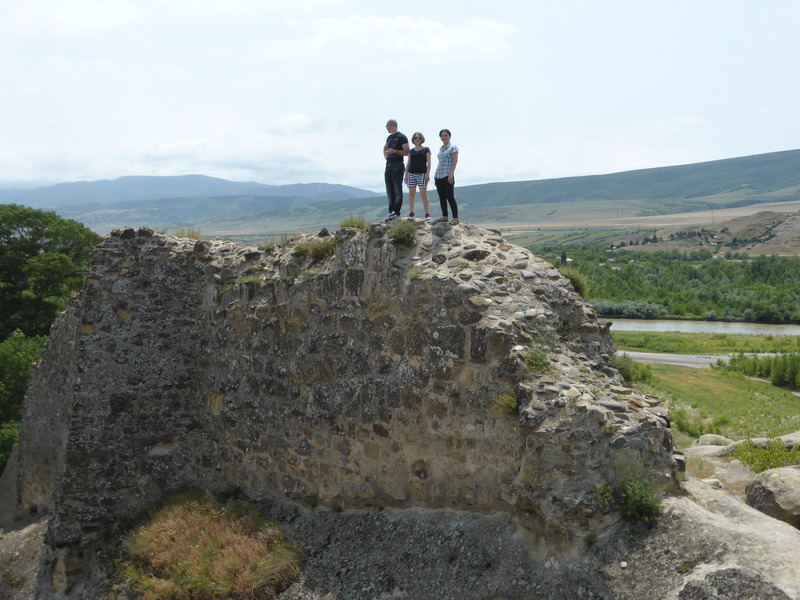 The Kings of Kartli took residence at Uplistsikhe when the Arabs took Tbilisi in the 7th Century. 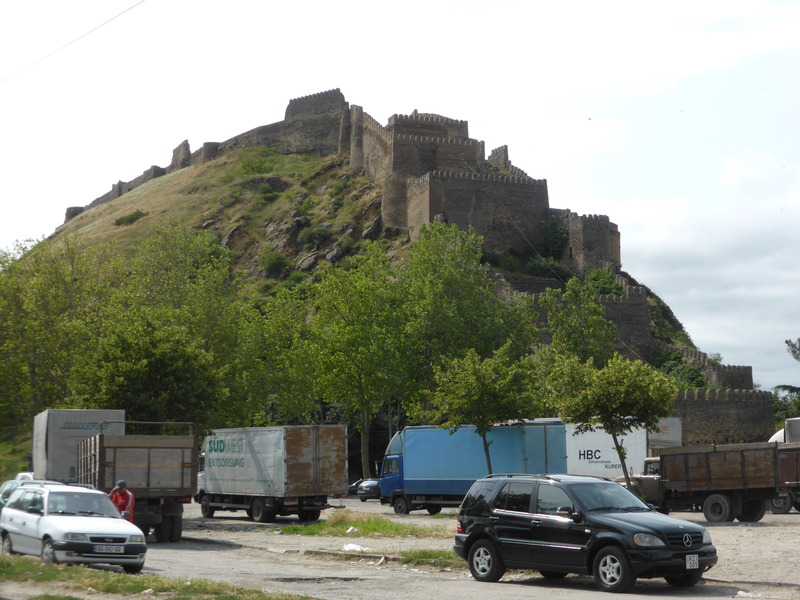 The city declined after David the Builder retook Tbilisi in 1122, and large parts were destroyed by the Mongol hordes in 1240 and later by Tamurlane (or Timur) in the 14th Century. Settlement of the caves was finally abandoned in the early 19th century. 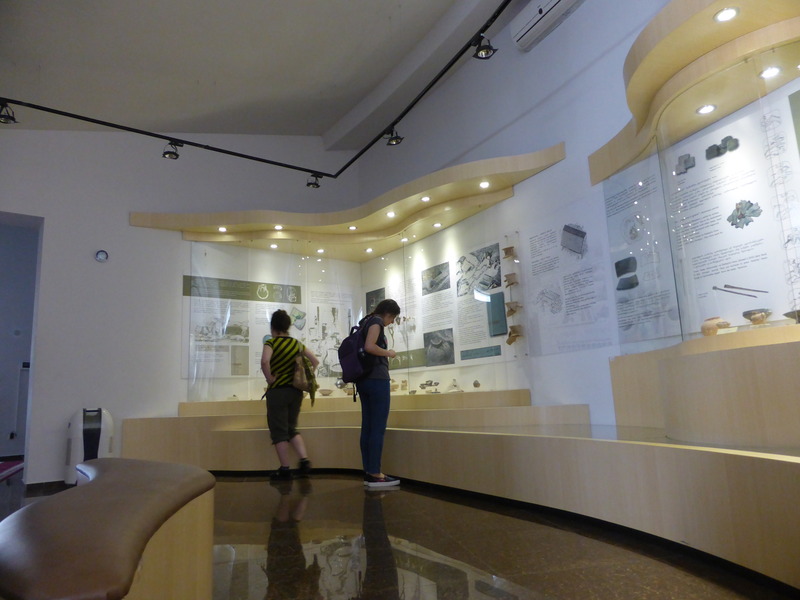 Our first stop was the museum, showing artefacts and a slide-show about the history of the caves. The slide-show was in Georgian but with English subtitles. 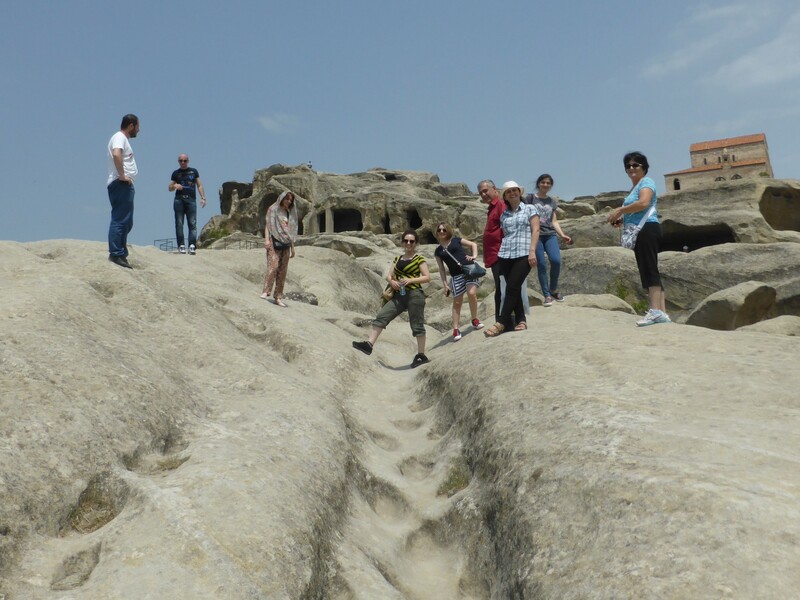 After our brief visit to the museum, we started to explore the cave complex. 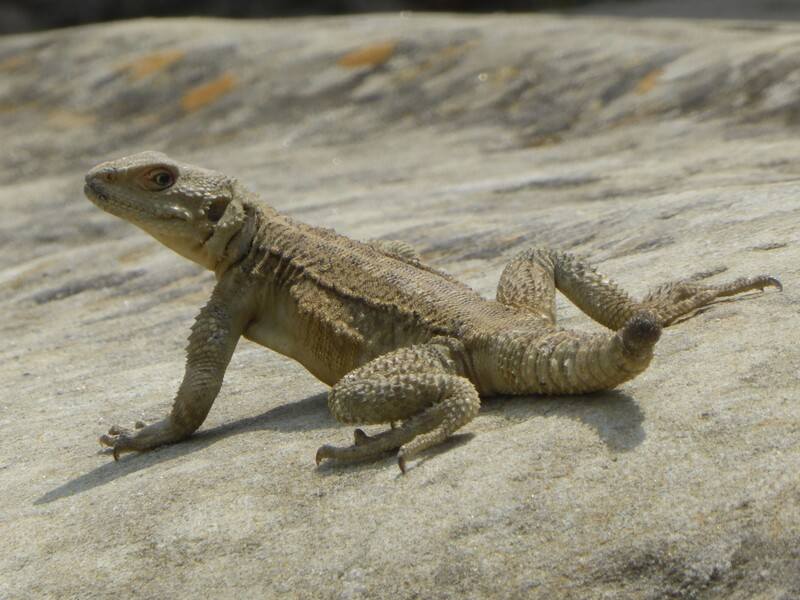 The heat of July meant there were a lot of lizards about. 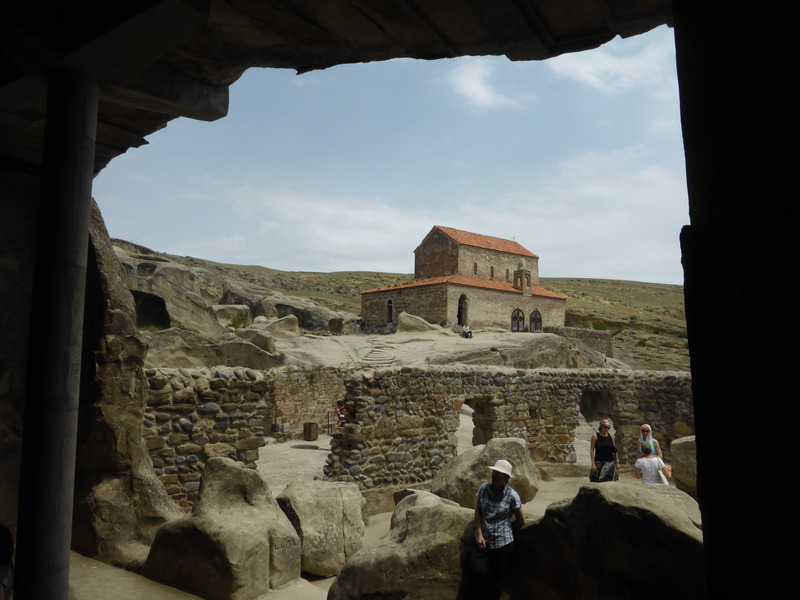 The 10th century church at the top of the complex is Prince’s Church (Uplistsulis Eklesia). 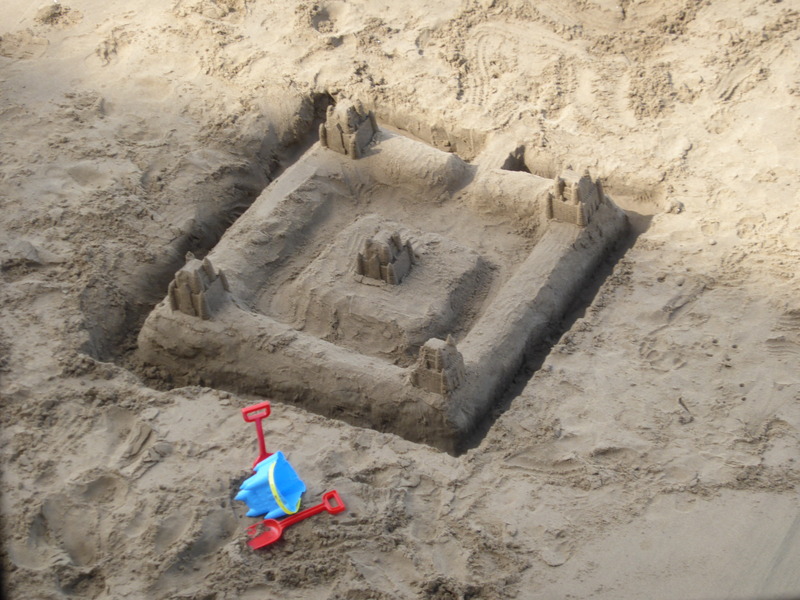 It was built over a pagan temple. 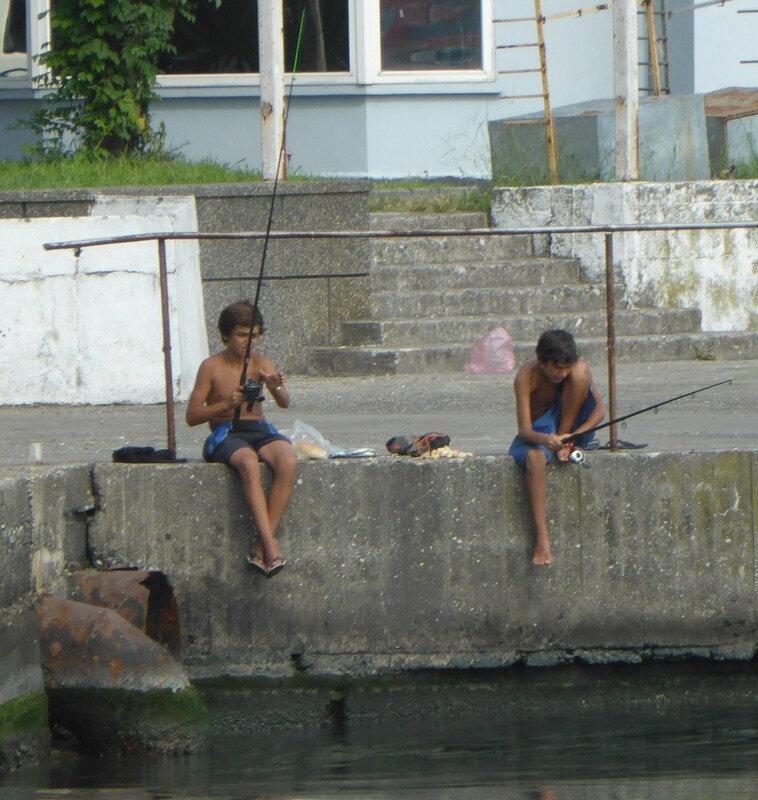 As with many Georgian sites, health and safety precautions are minimal compared to sites in the West. 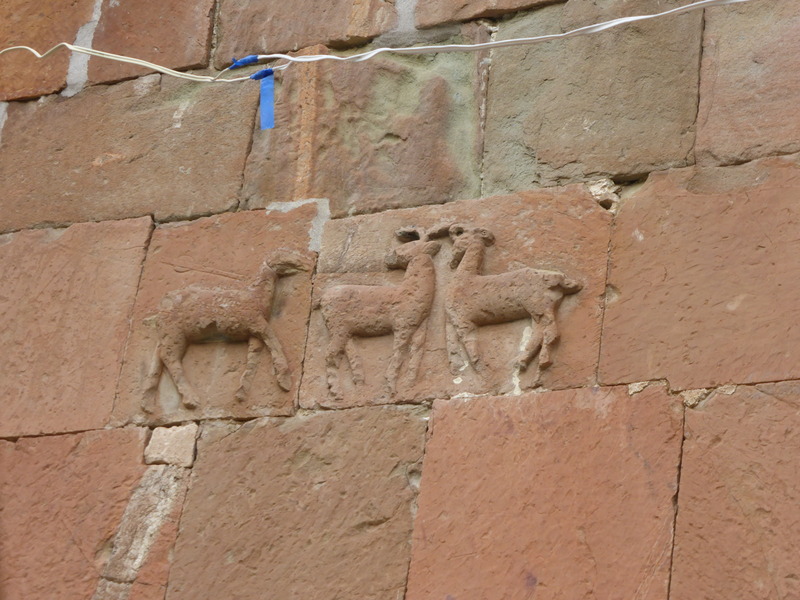 Beso, Tamuna and Khato on an old wall. Some first aid needed to be applied when Tamuna took a tumble. 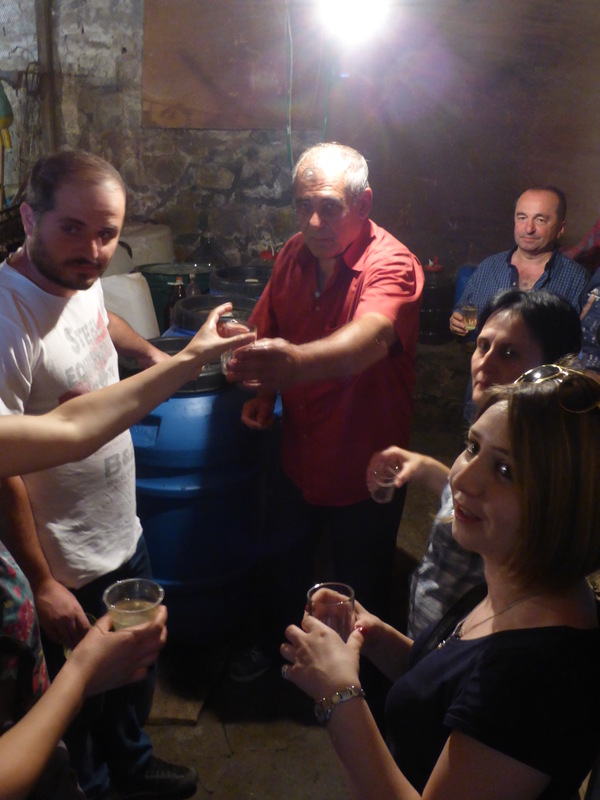 After touring the cave city we headed to Ateni a village where our friends Spartak and Nona live. Spartak has his own wine cellar with his own “champagne”. I’m no wine connoisseur, before coming to Georgia, I didn’t really drink alcohol and now I will only drink wine at Supras (Georgian feasts), but the Georgians were full of praise for he “champagne”. We had our first Supra, before heading out to a warm mineral pool in the beautiful Tana Valley. Georigan Supra al fresco, under a mulberry tree, where food is abundant and the wine flows freely. Our second destination was Ateni Sioni (ატენის სიონი) a seventh century church currently being restored, but still used for services. 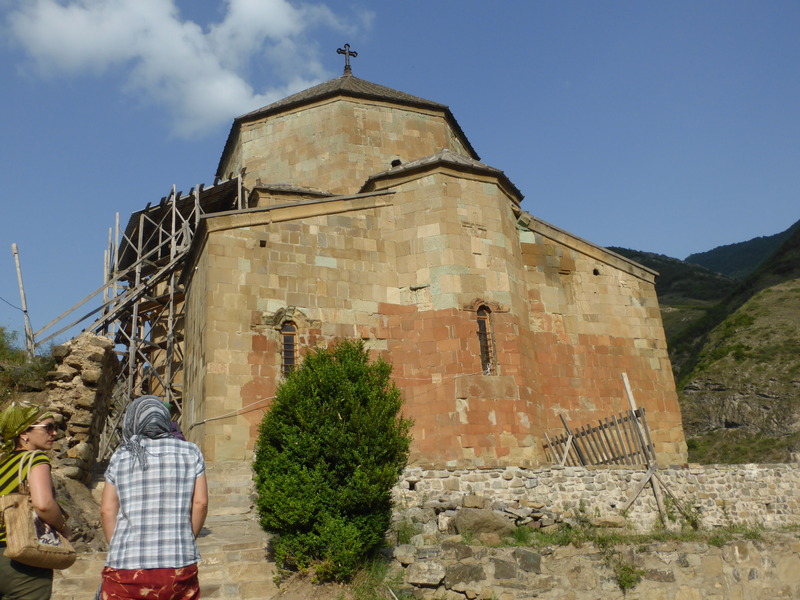 Architecturally Ateni Sioni is modelled on the Jvari Church at Mtskheta. 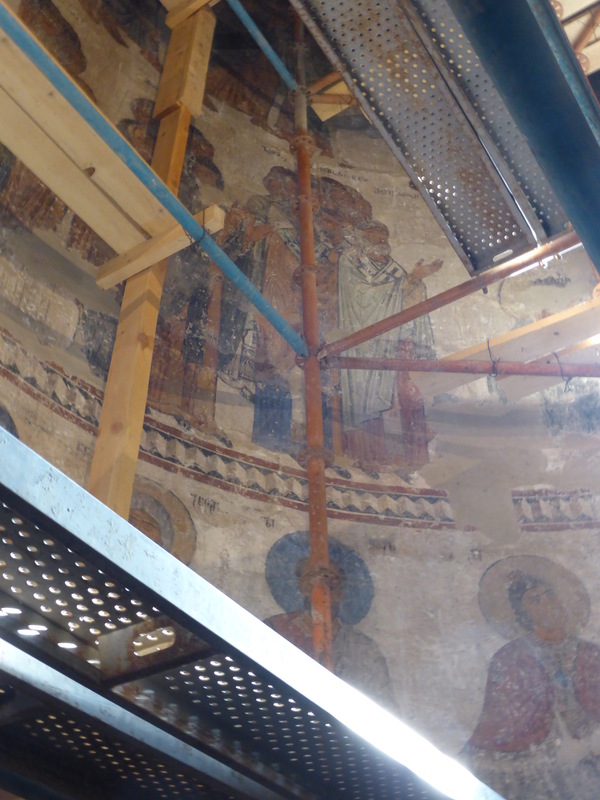 The eleventh century frescoes are among the finest medieval art in the country. Then we return to Spartak’s for a second and lengthy supra under a mulberry tree. Spartak is the “tamada” or toastmaster and makes very florid toasts, citing the poetry of Galaktion Tabidze and injecting a lot of humour into the toasts. 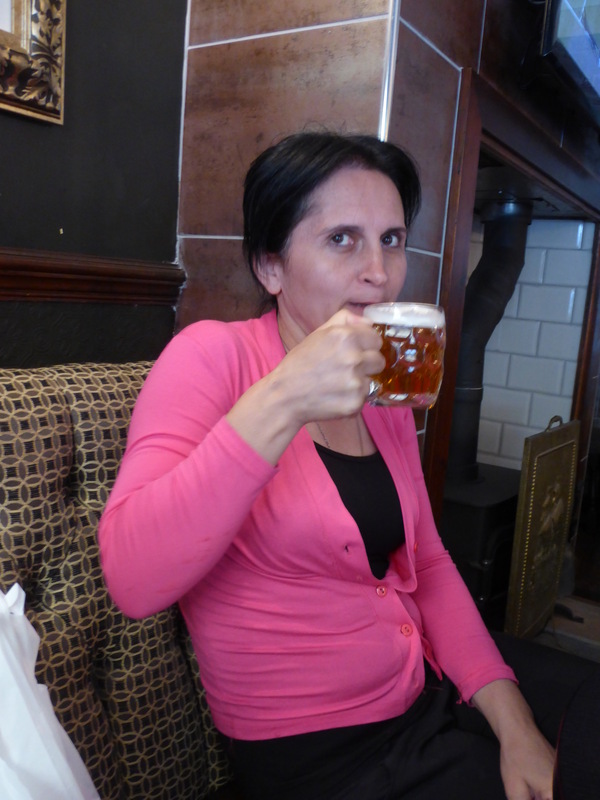 Tamuna making a toast and using a very ancient drinking vessel.